“Because I knew that I had the resources to do that. It became this mission that I just didn't want to give up,” she told TODAY’s Hoda Kotb. “I mean, I think to some people it might seem like, ‘Okay, Kim made a phone call to the president, showed up.’ We had been in talks and working on this for seven months. And it wasn't an instant thing. It was a lot of work." Johnson admitted that she had no idea who Kardashian West was when she first learned the television star had started championing her cause. A call to Ivanka Trump, the president’s daughter and adviser, eventually led to a May 30 Oval Office meeting where Kardashian West pleaded for clemency on behalf of Johnson. A week later, President Trump commuted Johnson’s life sentence. “Ms. Johnson has accepted responsibility for her past behavior and has been a model prisoner over the past two decades," the White House said in a statement. 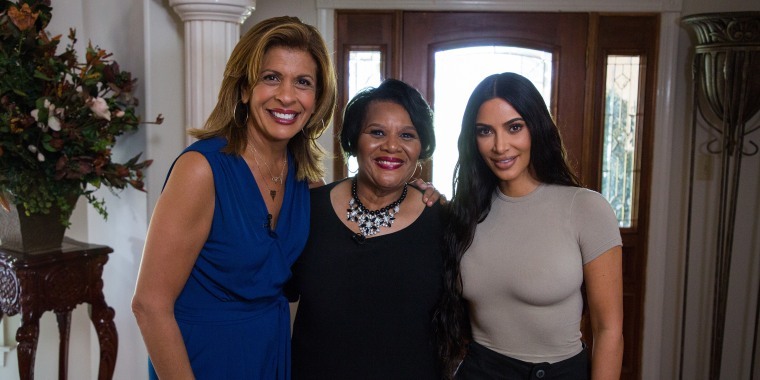 Kardashian West said she can imagine herself continuing to work on behalf of others with stories similar to Johnson's. "People have been asking me are you getting into politics? Like no. I'm still doing me. But I enjoy this," she said. "This has fulfilled my heart and so since I feel so fulfilled, why would I stop that?" Johnson said she not only feels grateful to Kardashian West but protective of her. She keeps a photo of the reality star and her husband, Kanye West, in her bible. Johnson said she plans to thank Kardashian West, and President Trump, by setting an example through the way she will live the rest of her life. "'Thank you' is not big enough. I think I have to walk it out. I have to walk my 'thank you' out. I have to live it out for her, for my family, for the supporters," she said. Johnson also plans to speak out on behalf of other nonviolent, first-time offenders. "I plan on continuing to magnify this issue. And I can't stop. I can't stop. I've lived it," she said. "I've walked with them. I have cried with them. My life is completely intertwined forever with those who were left behind. So it can't end here."